Cheshire West and Chester Council supports volunteering and the work done by the hundreds of volunteers throughout the borough every day. Residents across west Cheshire also support the commitment to recycling too, with 58 per cent of residents’ waste now being recycled, placing the borough in the top six per cent in the country for recycling performance and leading the way as cultural change sweeps the UK. Since 2012, residents have separated their rubbish between different containers for food waste, garden and dry recycling. One man who has contributed to helping change behaviour is council volunteer Jim Struthers from Kelsall. Jim volunteers for the council’s Waste Reduction Volunteers Programme, which aims to reduce food waste through the “Love Food Hate Waste” scheme by, amongst other things, promoting composting. Jim visits school and community groups to spread the message. 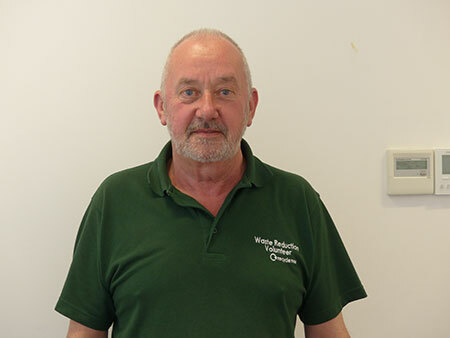 In addition, he volunteers as a driver for the Cheshire Community Development Trust, which is partly funded by Cheshire West and Chester Council. He is one of hundreds of volunteers across the borough helping to create a thriving community by giving up their free time to support the smooth delivery of council services. When the new waste recycling scheme was introduced in 2012, he helped deliver the new bins and advised residents how they should be leaving their waste at the kerbside. He then visited households, whose bins had not been collected because they had been filled with the wrong materials, to help them recycle correctly. Jim said: “Of course some people didn’t like the fact that their boxes hadn’t been emptied. Others would give very implausible reasons why there were things in their boxes that shouldn’t have been. We found that as long as you approached people in a non-confrontational way then we could find a way forward. Jim continues to spread the recycling message to school pupils. He added: “We take our own rubbish into the school and get the children involved; asking them which type of recycling box the rubbish goes into. The children are very receptive and will go back home and say to mum and dad: that does not go in that bin it goes in this bin. Jim also drives elderly residents to hospital, shopping trips and social visits in his volunteering role for Cheshire Community Development Trust. He said: “A lot of people I deal with when I am driving are very lonely people. Loneliness is a real problem these days. You become a friend and I suppose a bit of a volunteer confessional. It is nice when people trust you. “I volunteer because I know that I am doing something that is worthwhile. Most people are appreciative, they know you have helped them and you are doing it of your own free will and in your own time. If you wish to become a volunteer for the council then contact please email: Volunteering@cheshirewestandchester.gov.uk.